From mistletoe we now move on to yet another berried plant popular during the holiday season: holly. Indeed, this bright sparkly plant with its colorful red berries often finds its way into garlands and centerpieces, as well as the wreaths which hang on our doors. Christmastime and holly have gone hand-in-hand for centuries. 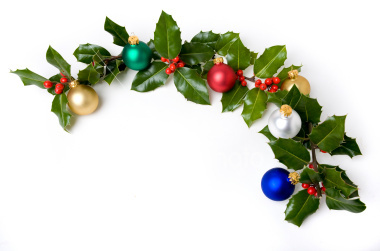 But the tradition of decorating with holly may actually have its beginnings before the celebrating of Christmas. Once again we have to look to the ancient Celts, for whom holly was one of their sacred plants, and featured in the Celtic Tree Calendar. The Celts called holly Tinne (“chihnn-uh”) and believed the tree symbolized the evergreen aspect of the whole psyche. 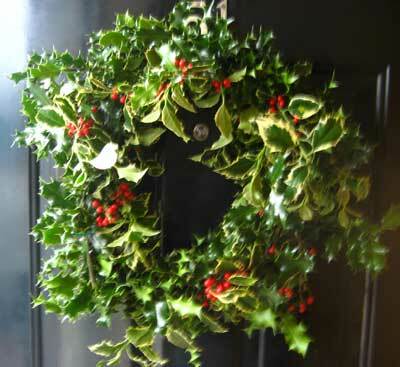 Along with mistletoe, it was also revered by the Druids, who decorated their huts with holly and used its curative powers as a remedy for various aches and pains. When the Romans conquered much of the Celtic Civilization in Europe – including the island of Britain, they noticed the prominence of the holly tree, and brought it back to Rome to use in their own celebrations of Saturnalia. It is thought that the Romans began the tradition of the holly wreath, giving them to others during these Winter Solstice festivities. A wreath was the selected shape because it represented eternity – a circle with no beginning and no end. In addition, its roundness might have served as a reminder of the sun, whose return was celebrated during these festivities. The holly itself, being an evergreen, was a reminder of everlasting life even in the middle of the death of winter. In later Christian times, the holly wreath came to represent the crown of thorns worn by Jesus Christ during his crucifixion, and its red berries represented His blood. Another legend of the holly wreath states that a little orphan boy, upon hearing of the birth of the Christ Child, wove a wreath of holly to give as a gift. However, upon approaching the manger, the boy became ashamed of his humble little gift, considering it unworthy to present to the newborn king. He began to cry, tears running down his cheeks and splashing on the wreath. But the Christ Child reached out with a smile to touch the little boy’s special gift, and the holly leaves then turned a shiny sparkling green and the droplets of tears turned into red berries. It was also believed that the holly was a symbol of good luck, and a place for the good fairies to play… thus beginning the tradition of bringing branches of the tree into the home during the winter months. This evolved into the more modern custom of decking the halls with boughs of holly, as we await the arrival of one big fairy king dressed up in a red suit. Holly was also thought to bring good dreams, and thus was hung on bedposts for such. You might want to consider hanging a sprig of holly over your own bed to encourage sweet dreams while snuggling under the warm covers. Much like the mistletoe, holly has its own myths and legends. As you deck your own halls and hang up your own wreaths, take a moment to enjoy the branches of this beautiful tree and revel in its many meanings.